The Toffee Club is home to the Portland Spurs, a Tottenham supporter's group. We welcome you to join us for this weekend’s match. Saturday, Feb 1st We are opening at 4:30 AM for Tottenham v. Newcastle. Thanks to Jack for opening so early! The Spurs group likes to sit on the East side of the bar. Please look for them there! All Tottenham fans are welcome to join the Portland Spurs. More information is below. Portland Spurs were founded in 2012 by Jason Urick and Andy Palmquist. Both long term Spurs supporters living in Portland. The two came together with the idea of an informal gathering to watch, cheer, and suffer together. During that first year, a core group of five or so (mostly thru Portland Timbers connections) would try to catch as many matches as possible together. It began to expand over the next few years after another lifelong fan, Jonathan Berube, opened a restaurant and allowed early morning access while the cooks prepped for the day. Things expanded rapidly as Spurs continued to gain momentum and Portland continued to grow as a destination city. By 2018, Portland Spurs had over 500 people joined via Facebook, averaged over 25 at each viewing party at the Toffee Club, where they now call home. Looking ahead, Portland Spurs leadership is excited to continue to formalize a structured group that can leverage the growing fanbase into strong fellowship and community impact. If you're a Tottenham fan looking for a supporter's club in Portland, please join us for..
Tottenham vs Burnley. The Toffee Club will open at 6:30 AM. Please feel free to join us at 6:30 as Tottenham matches are very popular at the Toffee. This is a friendly bunch and ALL Tottenham fans are welcome. Click here to email the Portland Spurs. 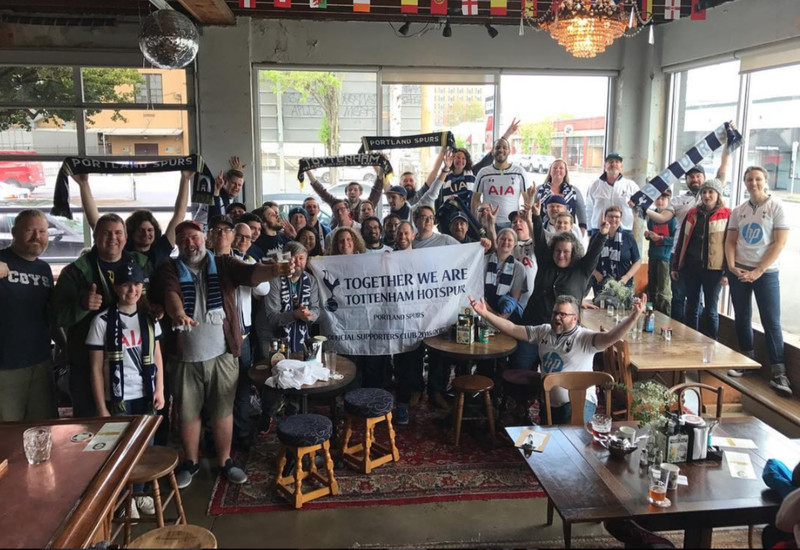 Portland Spurs Chair Jonathan: "We had a very successful fundraiser raffle at the Toffee Club after the last game of the season in May, where we raised over $5k. With that money, we have been able to sponsor the competitive youth team at Portland Community Football Club and our PDX Spurs logo will be on the fronts of their kits for the start of their new season at the end of this year. Many local businesses took part in donating prizes and our grand prize winner Richard won 2 tickets to London, 2 tickets to a Spurs match of his choice and 2 new kits for the 2018/2019 season. We live streamed the event on Facebook and had a great turnout. Hilariously, there was a Timbers vs Sounders match later that day and a busload of Sounders fans came in towards the end of the raffle and donated a split scarf of Timbers vs Sounders to our raffle." 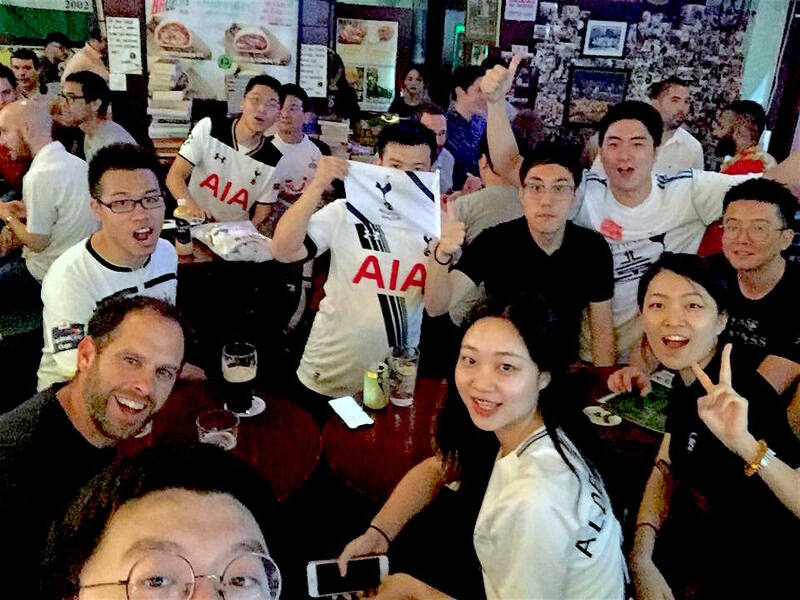 Thomas, the former chair of Portland Spurs moved to Beijing and found their local Spurs supporters club and shared a photo.